Venezuela’s prosecutor general wants Colombia’s authorities to help fight illegal gasoline smugglers along the porous border between the two countries. “We as the Public Prosecutor’s office urge the Colombian authorities to do as we are doing,” Tarek Saab said at press conference on Thursday. Saab said Venezuelan authorities in northwestern Zulia state seized 772,000 liters of oil, worth millions of dollars on the black market, en route to Colombia. “For those who said it was a myth that our fuel was trafficked to Colombia, this case is a reference,” Saad said. Venezuela’s military, who are supposed to stop smugglers, are largely responsible for abetting smuggling operations across Venezuela and into Colombia, according to Colombian newspaper El Pais. “In the border states, officials of the military act like another criminal group,” Venezuelan Journalist Sebastiana Barraez told El Pais. The Bolivarian National Guard is the military component in charge of the border and they have a type of coexistence deal with the FARC and ELN guerrillas, as well as with Los Rastrojos, Los Urabeños and Los Pelusos. Although there is a greater relationship between the military and paramilitary groups who control the fuel and food smuggling at the border. “Colombian authorities estimate that every day smugglers illegally pass 16 tons of food and about three million dollars in fuel across the border,” according to El Pais. Since Colombia has it hands full with narcotrafficking and guerrilla operations in the region, much of the fuel and contraband smuggling goes unabated. “What the Colombian authorities seize is not even 2% of what comes out of Venezuela,” a smuggler with more than 10 years experience told El Pais. Venezuela has long subsidized gasoline practically for free to its citizens, making gasoline smuggling lucrative when sold closer to international prices in Colombia. A gallon of gasoline that costs less than a cent in Venezuela can be sold in Colombia for up to $3, according to Insight Crime. The northeastern desert region of Colombia known as La Guajira is flooded with gasoline from Venezuela. It’s common to see vendors selling containers filled with Venezuelan gasoline along the highway between La Guajira’s capital Rioacha and the border town Maicao. Sources told Insight Crime that “more than 70 percent of Maicao’s economy could be devoted to smuggling,” where thousands of cars carry contraband goods into Colombia through vast illegal trails each day. Similarly, in Colombia’s most active border region in Norte de Santander, 41% of the fuel consumed in that department is contraband, a local fuel cooperative’s boss told newspaper La Opinion. Smuggled gasoline is then sent across Colombia, where it gets more expensive, and profitable, the deeper into the country it goes. Gasoline is also a key ingredient in the cocaine manufacturing process, meaning Venezuela’s cheap gasoline is likely fueling the profits for the drug trade in Colombia. For every kilogram of cocaine, 10 gallons of gasoline are needed for production. If Venezuela manages to slow the smuggling of gasoline into Colombia, it will likely increase the costs of cocaine in North America. 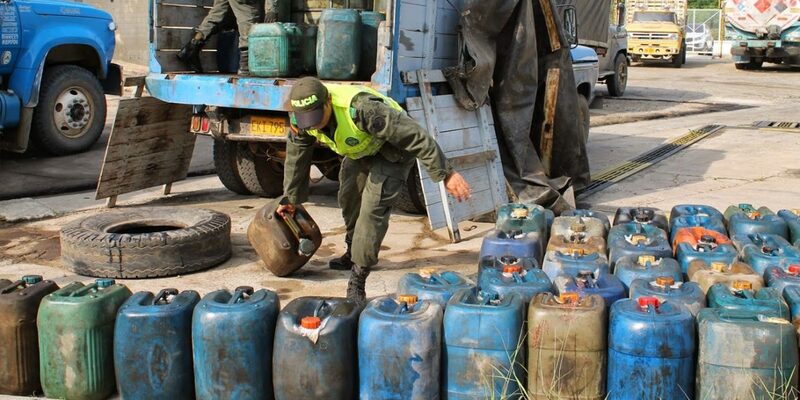 According to InSight Crime’s report, the new “Contraband Cartel” has dominated the gasoline smuggling business for the past 4 years in La Guajira, using the same strategies as their predecessors. The now-defunct AUC‘s Northern Bloc of extradited paramilitary commander “Jorge 40” dominated the gasoline smuggling trade in the region until they disarmed in 2006. They were followed by the Curicheros, led by Marcos Figueroa, a.k.a. “Marquitos,” in partnership with the ex-governor of La Guajira, Francisco Gomez, who were both imprisoned by 2014. For two decades criminal organizations have relied on the same strategy of using cooperatives, who are legally allowed to trade gasoline, to launder Venezuelan gasoline and sell at the local price in Maicao. The rest of the gasoline is sent neighboring municipalities and departments, using old allies of the Curicheros and new criminal networks that emerged in their place. In an effort to fight smugglers, Venezuelan President Nicolas Maduro recently announced a hike in oil prices to match the international market. Experts estimate Venezuela loses billions of dollars each year due to smugglers and domestic oil subsidies. To limit smuggling, Maduro said only those registered with a “Fatherland Card,” a state-issued identification card, will have access to subsidized gasoline in border states. Venezuela’s test plan to limit smuggling started on September 4th and will run for 15 days according to Maduro.